In addition to the heat flow normally transmitted through the building envelope due to air leakage for example, multi directional heat flows are created by thermal bridges. 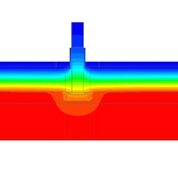 Due to these three dimensional heat flow paths, it is difficult to use traditional area weighted averaging to obtain the accurate effects of a thermal bridge. The heat loss contribution of thermal bridging on expected building envelope performance is calculated most accurately using thermal modeling. Moreover, whole building energy modeling used for performance based compliance to achieve LEED EA credit, becomes more accurate as a result. Using 3D heat transfer modeling, the consulting firm Morrison Hershfield demonstrated in ASHRAE RP-1365 that the thermal performance of building envelope details is more accurately defined using linear and point transmittance methodology. In this way, the additional heat flow caused by a thermal bridge is modeled as the difference between an assembly with and without the thermal bridging detail. 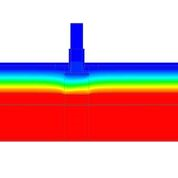 Once the effective U value of the assembly is obtained (which includes the effects of thermal bridging) the modeling can then incorporate thermal break solutions to improve the U value and reduce heat flow. Heat flow through clear field assemblies can also be evaluated and improved upon. Linear and point transmittances (heat flow) of building interface details together with clear field transmittances can be used with any building area to more accurately calculate the overall heat flow or U value used in whole building energy modeling programs. We have created an extensive thermal modeling library of interface details and wall assemblies for you to use on your next project. Each has been evaluated for thermal performance using Armatherm structural thermal break solutions to minimize heat flow and energy consumption. Roof dunnage penetration with thermal break. Roof dunnage penetration without thermal break.